PYEONGCHANG (Sputnik) - South Korean President Moon Jae-in declared on Friday the 2018 Winter Olympic Games in South Korea’s Pyeongchang open. 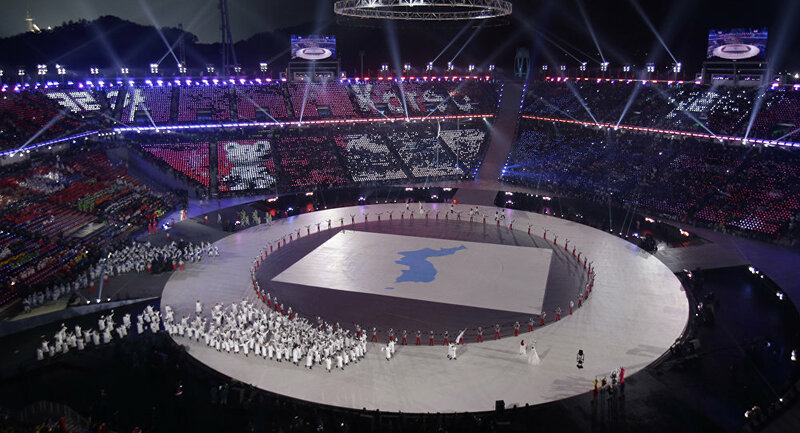 At the Opening Ceremony, the athletes of South and North Korea marched together under the "unification flag." The athletes who marched together as Korea were the last ones to enter the Olympic Stadium, as spectators enthusiastically welcomed them with applause and cheers. The flag was carried by South Korean bobsledder Won Yun-jong and North Korean ice hockey player Hwang Chung Gum. The unified Korea team have arrived to @PyeongChang2018! An historic moment for Bobsleigher, Won Yun-jong and ice hockey player, Hwang Chung-gum. — Olympic Channel (@olympicchannel) 9 февраля 2018 г. — ` (@Armys_Crew) 9 февраля 2018 г. South Korean figure skater Kim Yuna, gold medalist at the 2010 Vancouver Games, lighted the Olympic Flame at the ceremony in Pyeongchang. The international sports competition will last through February 25. South Korean Ambassador to Russia Woo Yoon-keun said on Friday the competition will contribute to easing tensions both on the Korean Peninsula, and in the world. "I think that our international events sports will allow us to establish peace not only on the Korean Peninsula but all over the world," the ambassador told reporters on the sidelines of an event at the embassy on the occasion of the Olympic Games. Athletes from 92 countries will be competing at the Olympics. The Russian team consisting of 168 participants will compete under the neutral flag because of the doping scandal. Woo Yoon-keun also thanked the Russian Olympians despite a range of disqualifications and bans. "I would like to express our deepest respect to the Russian athletes who agreed to take part in the Olympics despite the difficult situation. The Korean fans support the Russian athletes," Woo added. In December, the International Olympic Committee (IOC) suspended the Russian Olympic Committee over an alleged state-sponsored doping scheme in the country, which led to, according to the IOC, doping abuses by Russian athletes during the 2014 Winter Olympics. The allegations have been denied by the Russian authorities.